They shared many great back-to-school tips, but one word kept coming up time after time: ORGANIZATION. Yes, that is something that we need to work on around here. According to Walsh, organization helps keep the stress out of daily life and promotes confidence and self assurance. Good lessons for back-to-school beginners. The more you involve your children in organization, the more invested they'll become and the more likely they'll help in maintaining order around the home. Since this is our first year with kids in school, we're trying to start off on the right foot. We don't want to rush around in the mornings, and we want to avoid mad dashes out the door. The blogcast helped me get into the school year mind-set. Hopefully our transition from summer to school will go smoothly and with out worry. Office Max kindly sent us a box of Schoolio Von Hoolio school supplies to help us on our way to an organized year. 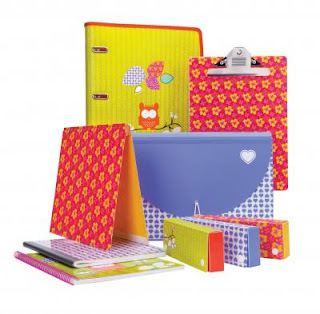 The box included binders, and expanding file, a notebook, pocket folder, composition books, and a pencil set. My daughter loves the owl and cupcake designs, and I'm sure all the supplies will get used throughout the year. Right now Office Max is running some great back-to-school deals for last minute shoppers. Finally had some time to pick the newest winners!